Most thriller matches finally get a result on penalties. Well that's what penalties are for! The star studded Argentine team bowed down to the Energetic Chile on the penalties. Chile crush them 4 -1 to clinch their first major trophy in form of the Copa America title that too at their home soil - a proud moment indeed. Argentina needs to wait for few more years to try their hands again with the trophy! Half of the stadium was filled with people wearing Messi shirts! 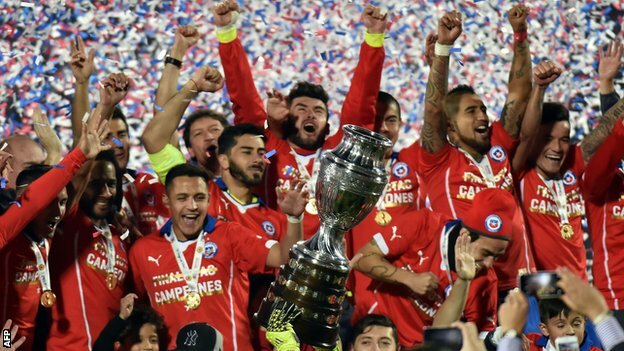 It could be envisioned as the South American derby with Chile and Argentina came. This match dragged much attention across the globe as Messi fans across the world got glued to their television set. Messi was yet to prove himself at a major level in terms of trophies. May be the last years humilating World Cup loss to Germany in the finals came haunting once again. Higuain still didn't seem to learn from his previous mistakes. His missed opportunities during the last minute of the normal time would have changed the results drastically. Also his penalty miss cost big for the Argentines. With Messi being the solo goal scorer for Argentina, it became obvious that the other team members did their best too. Messi can't click every time. A team becomes meaningful only when all the members contribute. One can't rely on a one man show everytime. That's what the greatest lesson that the match has taught. Chile on the other side with spearheaded by the Arsenal fame Sanchez and other greats like Vidal provided what could be the biggest victory in the Chilean Football history. Chile had outsmarted some good teams like Uruguay and Peru in the past and this time Argentina was on the facing side. On an ugly side, Messi's family had to be shifted into a television cabin after being abused by some Chilean fans.His elder brother Rodrigo was beaten as well.Chile was aggressive from the beginning. It reminded of the German team and the Oranje army from the Fifa World Cup 2014 held at Brazil. Argentina has defeated Paraguay and Colombia earlier. But their encounter against Chile seemed spineless effort. Every effort of the Argentines proved futile and Chile deserved every bit of it. Argentina stood no where to winning this game after seeing their performance through out.